Valley Voices is presented by the Academy of Music Theatre and New England Public Radio. Come out and hear some outrageous, funny and heartwarming true stories told in five minutes by your friends and neighbors from around the valley. The audience picks the winner, and a storytelling star is born! Grab a beer and get ready for a night of great entertainment. The winners of each slam will go on to compete in our “Best of Valley Voices” event! For more info and media you can visit the NEW ENGLAND PUBLIC RADIO Valley Voices page HERE! During the set audition period, call our designated phone line at 413-735-6688 to share the first sentence of your story and your contact information. Please share only the first line of your story. Speak slowly and clearly when giving your line and your contact information. Storytellers will be selected based on the strength of their first line and will be invited to share their story live at Valley Voices. Selected storytellers are encouraged to attend a free storytelling workshop, which will help to cultivate personal stories into performances. Storytellers will be offered the opportunity to purchase one ticket for a friend – we know you want moral support while you’re up on that stage! Stories must be personal, first-person narrative and from your life experience. Stories must be told without notes, props, costumes or musical instruments. Your story must relate to the theme. Each storyteller gets 5 minutes with a one-minute warning. You must be 18 or older and reside in New England. If you’ve participated in a Valley Voices story slam or auditioned for previous seasons you are welcome to re-audition. You may audition for all five events in Season 5. If you take 1st, 2nd or 3rd place in a slam, you cannot participate in other slams during the season (you will be moving on to the Best of Valley Voices in the fall!). All storytellers must agree to have their story recorded for use on the Valley Voices Podcast and filmed for the Valley Voices website by local cable access channels including Holyoke TV. The top 3 storytellers for each slam will go on to compete in the “Best of Valley Voices Story Slam” at the Academy of Music in October 2019. If you are in the top three, you must commit to sharing a story for Best of Valley Voices. The top three storytellers will be featured on the Valley Voices podcast. 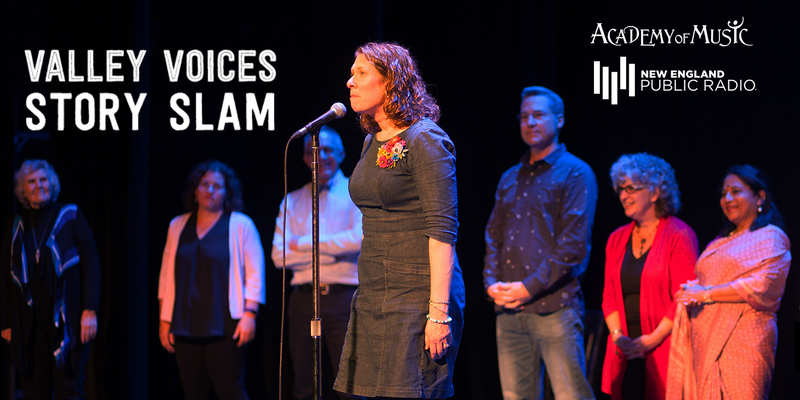 Members of the Academy of Music and New England Public Radio staff will select 10 storytellers and 2 alternates for each slam. Selected storytellers will be notified and are invited to participate in a storytelling workshop before the Story Slam to hone their story. Audience members will be given Audience Choice Ballots and will choose their favorite story. A volunteer panel from the Academy of Music and NEPR will tabulate first, second, and third place winners. The top 3 storytellers for each slam will go on to compete in the “Best of Valley Voices Story Slam” at the Academy of Music in October 2019. If you are in the top three, you must commit to sharing a story for Best of Valley Voices. The top three storytellers will also be featured on the Valley Voices podcast for that theme. Other stories collected could be used in other podcasts later in the season. The Valley Voices Podcast is available at nepr.net and wherever you find your podcasts.